Another incarnation of a minimalistic real-time strategy with RPG elements, developed by an independent studio called noio. Kingdom: Two Crowns is a minimalistic strategy game with RPG elements developed by an independent studio called noio. Published on PS4, PC and etc., the game follows the conventions established by the original – Kingdom, available on PC Windows, mobile devices, and web browsers. In Kingdom: Two Crowns, the story plays a secondary role. A player gets to visit a fantasy world inspired by Middle-Ages and assumes the role of a king tasked with providing for his subjects and protecting them. During the game, one observes the action from the side perspective. Gameplay revolves around two main aspects, the first one being exploration, during which one can acquire gold that can be given to the encountered settlers. This is when the second aspect comes in – recruited workers expand our domain by crafting tools as well as erecting production buildings and fortifications. The last ones are very useful after dawn when player’s domain is attacked by vicious trolls. During an attack, a player has to pay careful attention to his crown, as when it falls into enemy hands, the game is over. Interestingly enough, the development of one’s kingdom also depends on the atmospheric conditions (a drought can effectively destroy the crops) – luckily, a player can unlock numerous perks on his adventures. 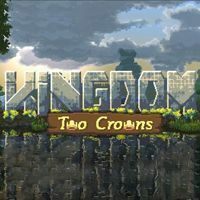 Unlike its original release from 2015, Kingdom: Two Crowns for PS4, PC and etc. features a local cooperative mode for up to two players. However, there is nothing standing in player’s way to set off on a journey all by himself. Kingdom: Two Crowns remains faithful to its original in terms of the pleasing to one’s eye pixel-art visuals. The game, however, features certain advanced visual effects that make it stand out from classic 16-bit hits.